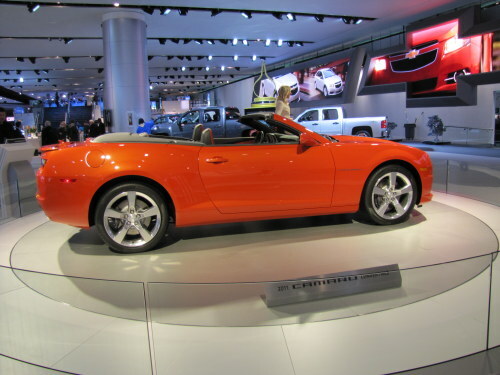 Chevrolet will also air five 30-second commercials during Super Bowl XLV Sunday on FOX. Featured in a combination of in-game and post-game ads will be the Camaro, Cruze Eco, Silverado HD and Volt. According to the official GM news release, this represents only part of a coordinated TV presence that continues into a special post-game episode of “Glee,” the FOX hit musical comedy. This post-game spot will promote an elaborate, longer-form Chevrolet ad, where the classic song “See the U.S.A. in your Chevrolet” plays a key role in the plot of the commercial. The following Chevrolet ads will air during the game: “Misunderstanding,” featuring the Cruze Eco; “Discovery,” highlighting the Volt; “Tommy,” highlighting the Silverado HD; and “Al’s Chevrolet,” starring the Camaro. The “Glee” commercial also will run during the game. “Ms. Evelyn,” featuring the Camaro, will air after the presentation of the MVP Award, also sponsored by Chevrolet. All of this year’s Super Bowl ads were created by Chevrolet’s agency of record, Goodby, Silverstein & Partners. Chevrolet advertising returns to the Super Bowl after a four-year absence.